Bruce is pretty calm. We got him as a pound rescue a couple of years ago. 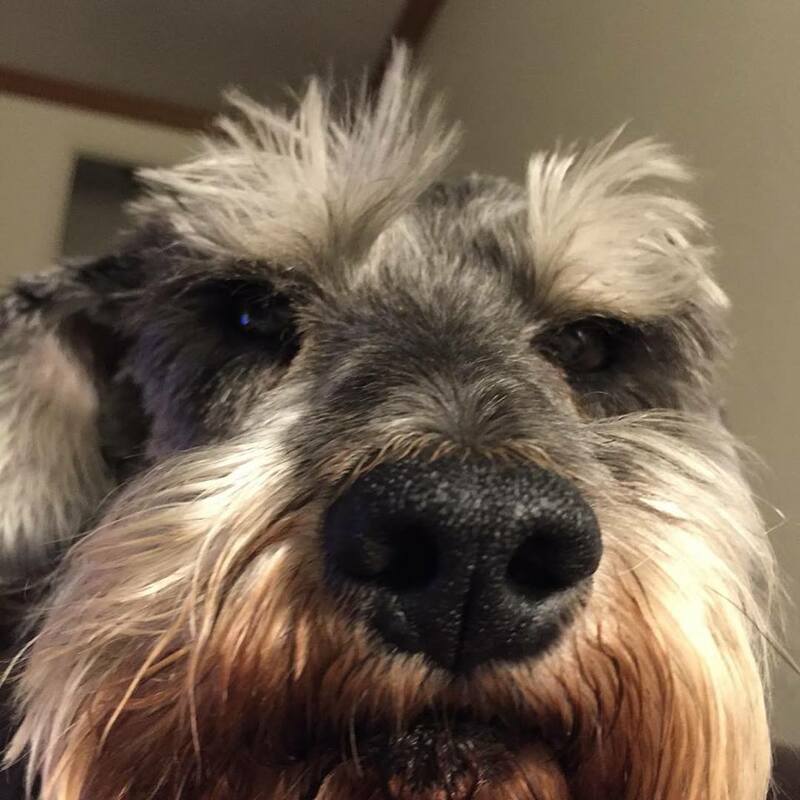 He was 9 or 10 at the time, and a full bred miniature schnauzer! The only problem with him was that the pound workers knew him by name, and had known his previous 2 owners. You see, Bruce is a runner. He will dart away at any given chance. He likes to explore. He likes to take long walks on the beach… or, I imagine he would if we lived near a beach. The previous owners gave up on coming to the pound to get him. Each, in turn, decided he wasn’t worth it. That’s sad, but that means that we got him, and that’s happy. Being an older dog, Bruce mostly just lays around, he’ll come and put his front paws on someone’s lap if he’s hungry or need’s to go outside. He jumps and howls like a hound dog when he’s excited, but mostly, he sleeps… that is, until he senses something is wrong. Dog’s have an uncanny ability to detect when something is wrong or even different. Our previous Miniature Schnauzer followed Julie everywhere during her pregnancies. It was at about month 7 that she realized the reason he wouldn’t even let her go to the bathroom alone was because he was protecting her. He could smell that she was pregnant, (or at least that something was different) and he was making sure she was safe. Bruce can tell when I’m having panic attacks (all too frequent since the anxiety started a couple of years ago), and he can also tell when my hands and arms are seizing up from the fibro-pain. The thing is, I can’t always tell when one of those two things is happening (at least not until it’s WELL into the process). Julie laughs a bit at my ignorance (in good humor). I always hurt, I’m always in pain, and I can’t always tell what hurts, or what’s in pain, because it’s always there. Bruce knows, however. And then he stays on my lap and holds me. He just will snuggle onto my lap and let me pet him. (When it’s hot, he’s determined to pant in my face, just to ensure that I know how much he loves me). I don’t understand how it works, but petting him helps keep the panic attacks from really taking over. Petting him will usually keep my hands from completely locking up in pain, though I have noticed no significant reduction in the pain. Because he’s so helpful, I’m often question why I don’t certify him as a service animal, so that I can take him anywhere. The answer is a bit varied and complex, but I’ll give the basics if I can. Service animals, as defined by the ADA, are DOGS that perform work or tasks for a disabled person. Because service animals are considered a medical device, they are allowed, by law, into any public area (with a few, nuanced exceptions). However, the owner is still responsible for the dog’s behavior, and therefore the dog must ALSO (along with performing work or tasks) be well behaved. While Bruce “alerts” to my attacks and mini-flares, he’s not actually performing any work or task, he’s just being a dog. A good dog? Yes. A smart dog? Yes. But a medical device? No. Further, Bruce, as proved by his history in the clink, doesn’t have good citizenship. He like’s to jump on people. He likes to bark when he’s excited. He likes to run, and pull, and tug on his leash. He, therefore, falls into a second category of medical animal: an Emotional Support Animal, or ESA. Because he does help me medically, (primarily emotionally, though the fibromyalgia mini-flares are, by the majority of accounts, not emotional, but physiological), he does gain some rights under the ADA, primarily, an apartment complex that doesn’t normally allow pets cannot turn him away. Other animals besides dogs can qualify as ESA’s, though most common besides dogs are cats. Some people use pigs, miniature horses or any other pet. It is this category that is most often abuses by people who just want to keep their pet. While I almost always take Bruce with me when I leave the house, because he isn’t a Service Animal, I cannot demand his acceptance into any building. I’m at the mercy of the store or shop or place as to whether or not I can bring him in. If you didn’t know that before: NOW YOU KNOW. If you happen to find Bruce wandering your neighborhood: please call me, I’m probably looking for him.